This was an impromptu dessert I made. 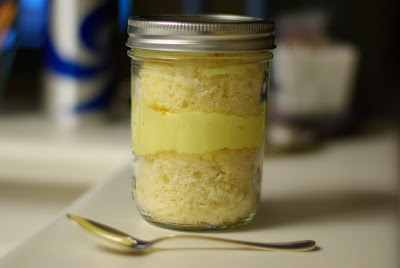 I had leftover cake scraps from my cake in a jar recipe and thought this would be a great use. 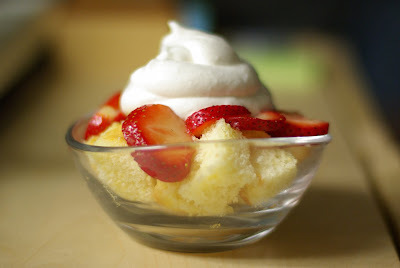 When I thought about making this, I considered myself lucky to have fresh strawberries and heavy cream in my fridge already waiting for me. I sliced the strawberries and macerated them in a bit of sugar to create a sauce that could soak into the cake. I whipped the fresh cream with some sugar, vanilla extract and a splash of Grand Marnier to make a luxuriously sinful accompaniment to the strawberries and cake. I don't think anyone would guess that the base of this dessert was born from leftovers. 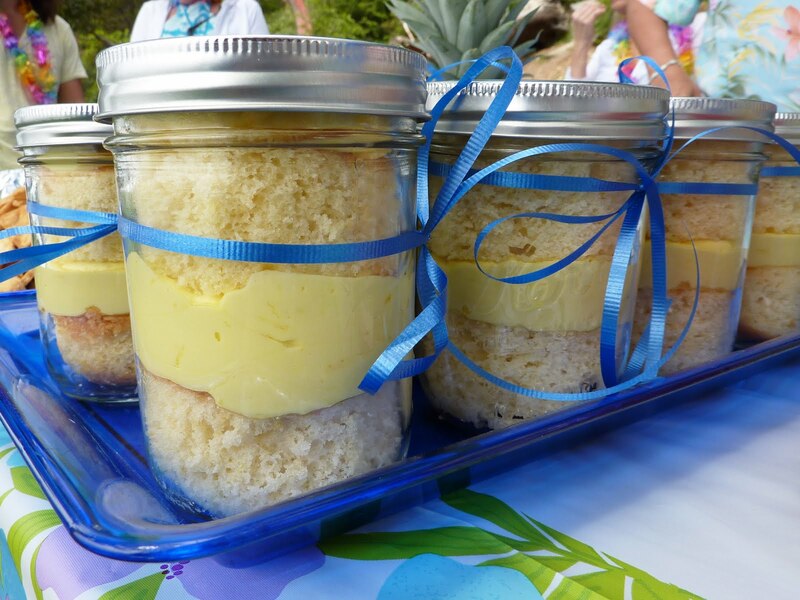 Who doesn't love cake, especially when it comes in jars? I wish I could take credit, but the concept isn't original. Nonetheless, people are wowed when they see them. Some know that traveling with a whole cake isn't the easiest thing to do. The cake might slide around in whatever vessel it's being stored in, and the frosting might get mangled. If it gets to the destination intact, then there's the messy cutting, portioning, plates and utensils to deal with. Hence, the jar! With a little easy work at home, these cakes are easy to transport, the portioning is already done, and people can easily take them home. And no cake vessel to take back home and clean, either! 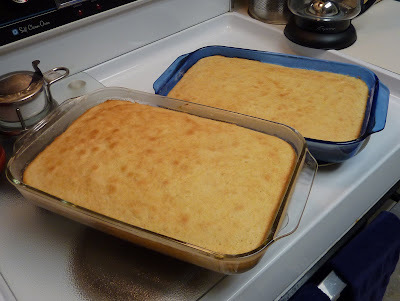 This is the recipe I used: Lemon Buttermilk Sheet Cake (sans glaze; substitute 6 cans of Mountain Dew). 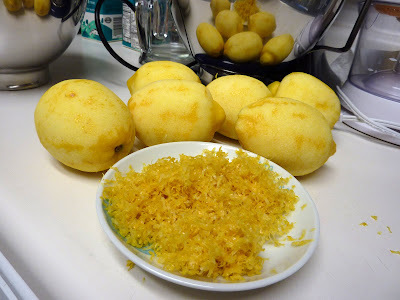 Here's how mine started: Lots and lots of lemon zest. And a Mountain Dew. I made this cake late the night before the party where I served this, so I had plenty of Mountain Dew to help keep me awake. 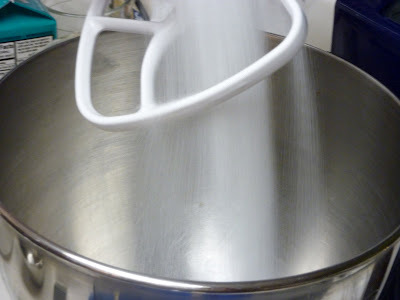 After my first sip of the unnaturally neon green bubbly beverage, I added the zest and sugar into the mixing bowl. This gets mixed with plenty of butter (and another sip of Mountain Dew). 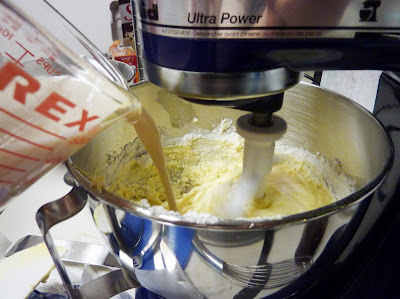 Once that's creamed together, I alternate mixtures of buttermilk and cake flour (and a gulp of Mountain Dew). 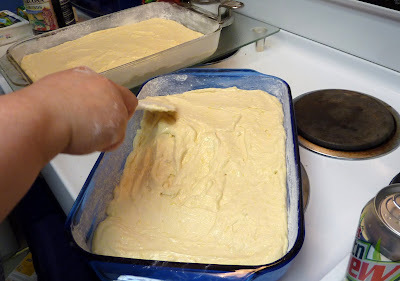 Then the batter is done! I made a double recipe and spread into two different 13x9 prepared pans. I gulped more Mountain Dew. After baking for 35 minutes, the cakes look golden brown and delicious. I rewarded myself with more Mountain Dew. 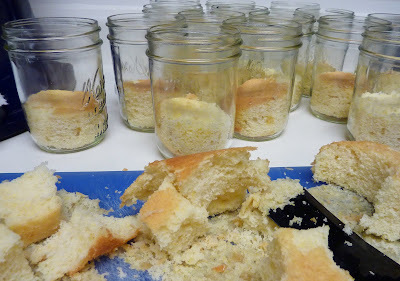 After cooling, I cut out the cake circles (using a round cookie cutter) to fit in the jars (I used wide-mouth pint jars). Chugged another Mountain Dew. I mixed the zest of three more lemons, a whole stick of butter (then drank another Mountain Dew), a pound of cream cheese, two pounds of confectioner's sugar, two teaspoons of pure vanilla extract, and a couple toothpick shmears of summery lemon yellow gel food coloring. 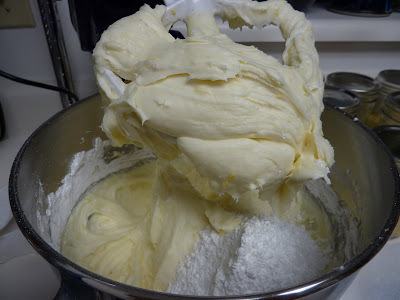 This makes a LOT of frosting. Keep in mind that I made two recipes of cake. 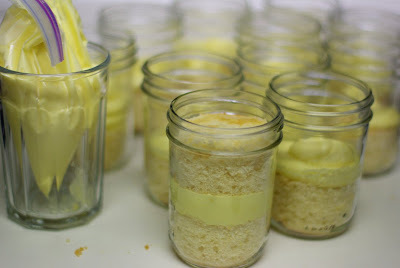 I put all the frosting in a zip-top disposable bag, snipped a corner and piped the frosting into the jars after placing a cake round in each one. Another cake round goes on top of the thick layer of frosting. Then on top of that (and another Mountain Dew later), a thin layer of frosting goes on top before placing the lids. Voila! Cake in a jar. The only additional accessory I needed to provide was a plastic spoon with each jar. They were a hit. I hope I didn't accidentally pour any Mountain Dew in the cake batter or frosting. No one mentioned any "off" flavors. Or maybe it just added to the flavor. Hmmm. Regardless, this is a fun concept for any party. And they're fun to make! I'll definitely do this again. 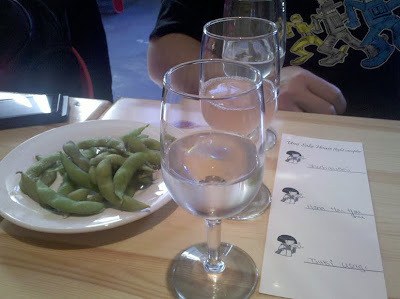 Yet another Japanese dining experience (done locally in Seattle -- the belltown neighborhood, to be exact). 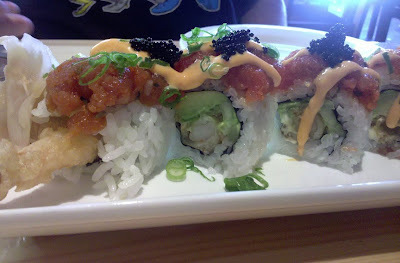 This one is brought to you by Umi Sakehouse. 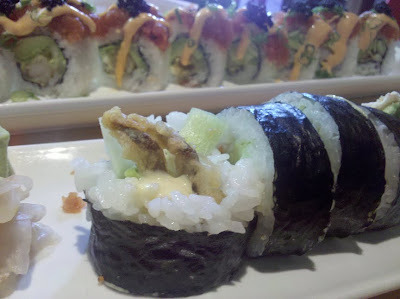 I'm not a fan of the late-night club-vibe neighborhood, but I am a fan of this modern Japanese restaurant. They have a great happy hour menu. 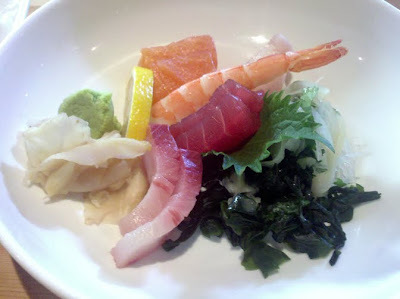 We also sampled the sashimi plate, which had two different kinds of grade-A tuna, salmon, and shrimp (the shrimp was cooked). We had a great time in the dining area of the "back porch" of the restaurant, where the ambiance is traditional Japanese with large skylights and bonsai. The entire restaurant is designed in a way that mirrors a Japanese country house, with both a front and back porch. Give Umi a try if you're in town. Two thumbs up from me! 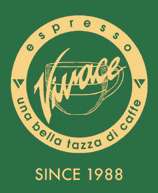 Espresso Vivace is one of my favorite coffee establishments in Seattle. 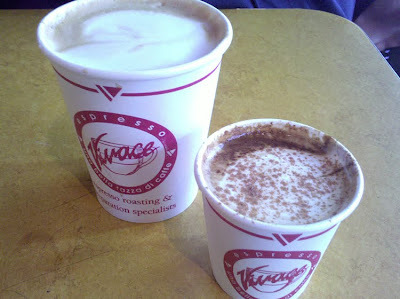 We take our coffee-drinking seriously here in the Northwest, and Vivace doesn't dissapoint. They roast their own beans and have creative drink concoctions on their menu, including the Cae Nico (in the small cup pictured above). It's a 4-ounce blend of espresso, steamed half-and-half, vanilla and orange essences, sprinkled with cinnamon. Close your eyes and inhale the aromas. Now sip and savor the magic on your taste buds. I think I need to get another one now. 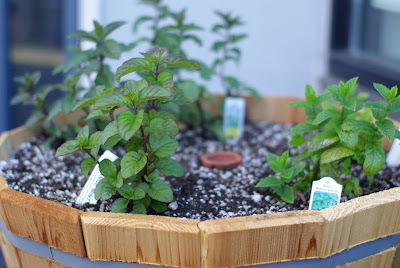 Grow, mint, grow! The rum and limes are getting restless. 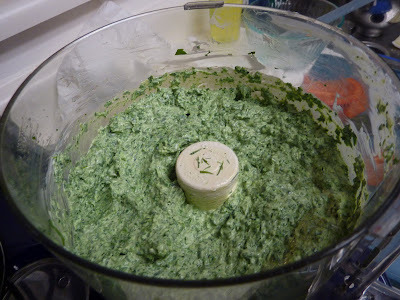 I found a great Herbed Spinach Dip recipe from cooksillustrated.com that doesn't involve dried soup mix. It's fresh and herbalicious. 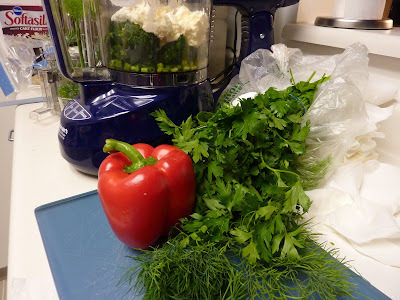 Ingredients include fresh flat-leaf parsley, scallions, dill (fresh from the garden! ), garlic, and of course, spinach. Equal parts of mayo and sour cream (I use light) makes everything creamy. 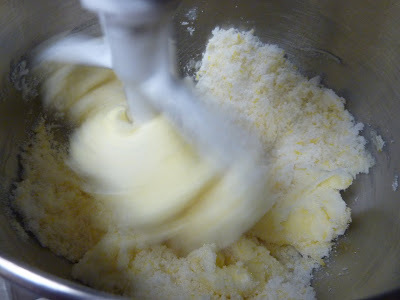 Everything gets blitzed in the food processor. So easy! Finely diced red bell pepper gets folded in at the end to provide a crunchy contrast to the creaminess. I love this dip with pita chips or bread. This recipe is worth seeking out. Try it. Let me know how you like it.